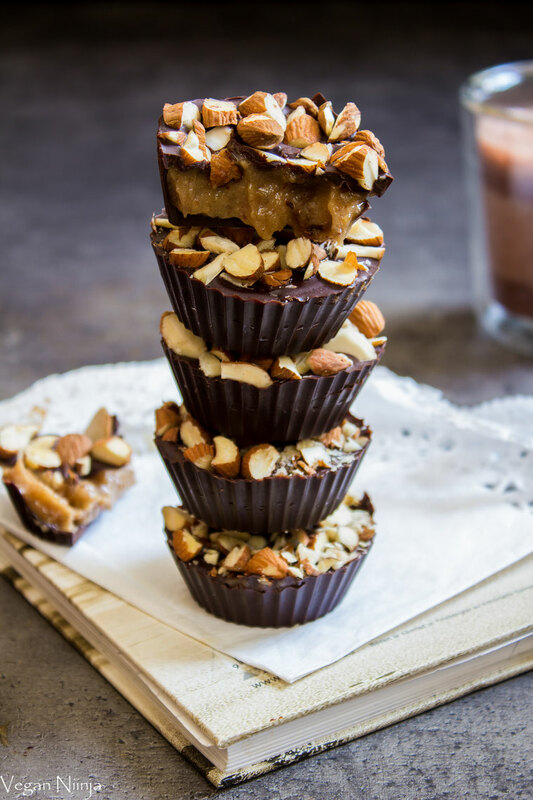 Chocolate Cups with Maca Carmel - simply & healthy vegan recipes that taste amazing! If you are a chocolate lover and would like to try maca, than this is a great dessert for you! 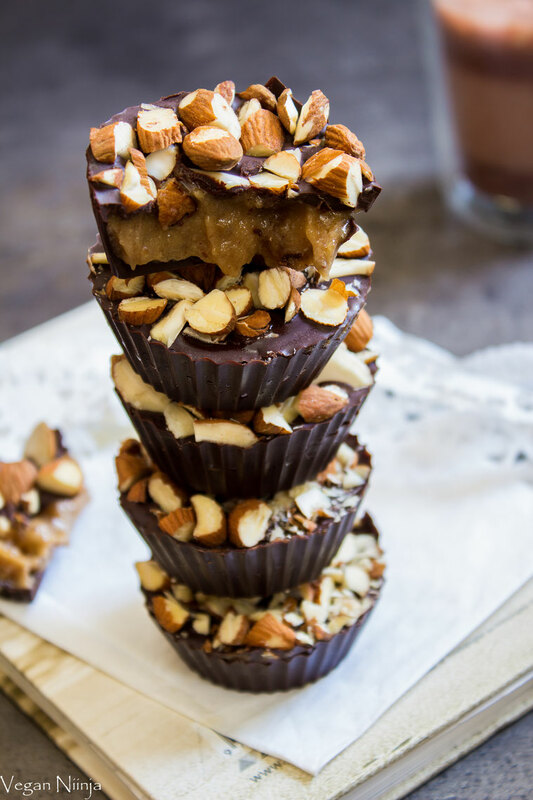 The nuts gives them a crunchy note, and that caramel filling is sweet and soft which is a great combination with the bitterness of the chocolate. Use silicone molds or praline molds for the chocolate cups, and add about 1 tsp of the melted chocolate in each mold. Cover the sides and the bottom of the molds with the chocolate, be sure to leave enough chocolate to cover the filling later on. Let the chocolate set in the freezer until the filling is ready. Blend the soaked dates (without the water, together with the nut butter and banana until smooth. Then add the maca, sea salt, and vanilla and blend some more. When needed add a little planbased milk to the filling to make it more creamy. 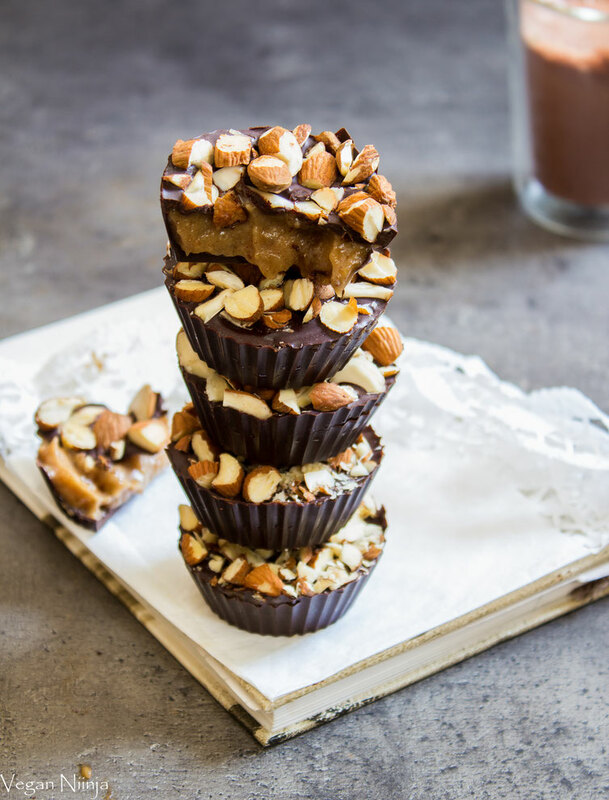 Add a little of the filling in the chocolate cups, and cover with the leftover melted chocolate and the chopped almonds. Freeze 20-30 minutes until set. Storage in the fridge. If you enjoy my recipe and want to give some feedback, feel free to leave a comment below!